BEETHOVEN is such a handsome boy. 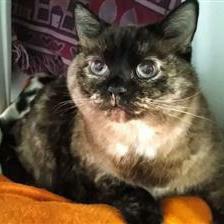 This 4 year old is friendly and affectionate, with a great personality. 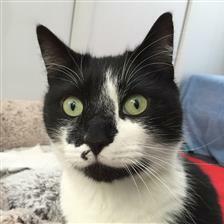 He enjoys lots of attention and will purr a symphony when he gets it! He dribbles because he loves to be stroked so much and loves sitting on your lap too. He is at the London Centre. Click here to offer him a home or find out more. Look at beautiul GHOSTIE! This independent lady found herself at Wood Green Godmanchester through no fault of her own. She wants a nice new forever home with owners that don''t mind her bringing them gifts to show them how much she loves them! 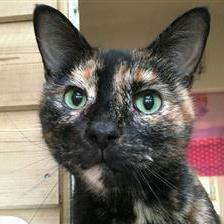 She is very affectionate and loves a fuss too! Click here to find out more about Ghostie! Two tortie girls and a tuxie boy? If we were in the U.K., my human would want them all! Baboulette, Beethoven and Ghostie are all gorgeous. We will share them now! All the kitties have wonderful expressions. I hope they all find their perfect home soon. They are all beauties, I wish I could adopt them all. I hope they all find loving forever homes soon.